“Why is the Government going so far in this case, using these gutter human beings as their prized evidence? . . . It’s not because of their claim that they need to stop Joaquin Guzman from dealing drugs which reach America. It’s because a conviction of Chapo Guzman is the biggest prize that this prosecution could ever dream of. And they have dreamed of it for decades.” Tr. at 578:18-22. “[The defendant] is not even alleged to be the biggest drug dealer in Mexico. But who is? … A man who is 70 years old and has operated as a drug trafficker for 55 years in Mexico without ever being arrested, despite being first charged in an American federal court 40 years ago, a man you’ve never heard of before today: A man named Ismael Zambada, or Mayo for short, Mayo Zambada.” Tr. at 584:14-25. “Mayo [Zambada] was under multiple indictments in America, his sons and brother are cooperating with this government, and, yet, not only has he never been arrested, but he is continuing his multibillion dollar leadership of the Sinaloa Cartel.” Tr. at 585:19-23. “The U.S. government pretends to want [Zambada]…. But somehow they still can’t seem to develop the information required to lead to his arrest. You figure it out.” Tr. at 585:24-586:3. “The bottom line is that the world is focusing on this mythical El Chapo figure. The world is not focusing on Mayo Zambada, to allow him to remain free and in business.” Tr. 587:23-25. The Government claims the above is an assertion of selective prosecution, which the Court, on prior motion by the Government, previously ruled the defense cannot raise. “[T]here is another side to this story, an uglier side to this story…that the governments of Mexico and the United States do not want you or anyone else to hear about.” Tr. at 576:13-16. Lichtman raises the Cardinal's murder at the airport in 1993. “So, who did the Government of Mexico and the Arellano Felix organization decide to frame for this murder? 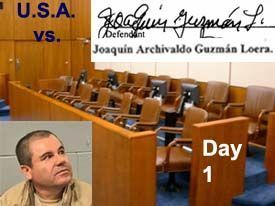 Joaquin Guzman.” Tr. at 582:24-583:1. “Now, the backdrop, if I can, to this trial is the American war on drugs.” Tr. at 589:4-5. “We had that whole ‘Just Say No’ era during the Reagan years, which obviously accomplished nothing.” Tr. at 589:12-13. “And you will see again that while he has been here in America, the flow of drugs hasn’t stopped. Nothing has changed, business as usual.” Tr. at 590:3-5. “They claim that he is the biggest drug dealer in the world, the biggest that the world has ever seen.” Tr. 578:24-579:1. “And that began the beginning of the mythological status as El Chapo, the biggest drug dealer in the history of the world according to the press and the governments of America and Mexico.” Tr. at 583:16-20. “But as I said earlier, this team of prosecutors from all over the United States will tell you that Joaquin Guzman is the biggest drug dealer in the history of the world.” Tr. at 584:10-12. The Government says it didn't charge him with being the biggest drug dealer in the world, and the CCE (Continuing Criminal Enterprise or "Kingpin" statute as it is unaffectionately called) only requires them to prove he is “one of several such principal administrators, organizers, or leaders” of the charged enterprise. It says the substantive distribution, importation and money laundering counts don't require he be a leader at all. I think that's a very disingenuous argument since even if he's convicted of a single count at trial you know the Government will ask for a four point role in offense increase under the advisory sentencing guidelines for being a leader of an extensive organization with five or more members, and point to the amount of money he made as worthy of another two points because it was part of a pattern of criminal conduct engaged in as a livelihood, rendering his guideline range life in prison. So whether he's convicted of the "kingpin" statute or not, the Government is going to insist his guideline range is life in prison. It doesn't get any bigger than that -- life plus cancer is not yet a sentencing option in this country. The Cartel expanded control of border towns not only between the United States/Mexico border but also between the Mexico/Guatemala border. The Cartel infiltrated other Central American countries, including Honduras, El Salvador, Costa Rica and Panama. Moreover, the Cartel embedded representatives in South American source countries, including not only Colombia, but also Ecuador, to negotiate directly with the sources of supply. “In fact, the cardinal was assassinated. And very possibly by the Mexican Government in an effort to shut the cardinal up.” Tr. at 580:13-15 (emphasis added).  “THE COURT: I need you, as discussed, to focus more on what the evidence is going to show and not argument. MR. LICHTMAN: Judge, this is going to be coming, perhaps, from a witness in this case.” Tr. at 580:24-581:2 (emphasis added. If it comes from a witness it's evidence. The issue will then be whether it's relevant and admissible. Since El Chapo fled after the 1993 cardinal shootout, where by almost every account, he was to be the victim (not perpetrator) and the Government wants to bring this up at trial, I think he should be entitled to present a witness whose testimony discredits the government's assumption. Finally, as to Lichtman's claims about Calderon and Pena Nieto, if the Judge wants to strike them stating he can't back them up, I 'd suggest he try to get well-respected journalist Annabel Hernandez on board (if he hasn't already). In her book Narcoland (English) and in interviews like this one and this one in the Texas Observer, she makes the same claims about both Calderon and Pena. Or, how about this 2012 Guardian article quoting incoming Mexican President Lopez-Obredor after the 2012 election in which he "accuse[d] president-elect Peña Nieto of using illicit funds and money laundering to finance his campaign." "Peña Nieto benefitted from funds of illicit origin, what is commonly called money laundering" López Obrador said at a press conference on Wednesday. "It would be very serious if the authorities did not investigate. They would be covering up a crime." Shorter version: The problem is the corruption, not the drugs. I also think the Government didn't get blindsided as much as hoisted on its own petard. encapsulation of various aspects of the "drug war." Thanks for relaying it. like a powerful, but permissible, warning to the jury about the bias -- and thus, the credibility -- of the government's witnesses, which is fair game for an opening statement. It is not an improper "selective prosecution" argument at all, as far as I can tell from what you quoted. argument, not a proper opening "statement." but did admonish defense counsel in front of the jury (which makes it a sort of official spanking) for going beyond what he can reasonably expect to prove from the evidence.